PHILADELPHIA, PA – December 7, 2017– Janney Montgomery Scott LLC (“Janney”), a leading full-service wealth management, financial services, and investment banking firm headquartered in Philadelphia, PA, is pleased to announce that industry veteran Vivian Altman has been promoted to Head of Public Finance for the firm’s Fixed Income team. In this role, Ms. Altman will be responsible for banking, strategic planning, coordinating execution with underwriting and sales, and expanding Janney’s Public Finance presence. 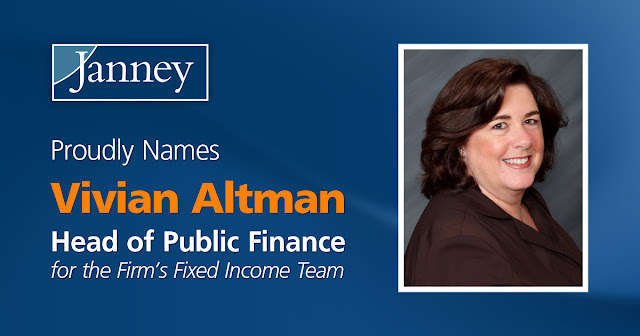 Ms. Altman, who previously held the role of Head of Origination and National Strategy at Janney, has been with the firm since 2009 and has over 30 years of experience in public finance. Throughout her career, she has had a managing role in structuring and preparing issues for the market, financing general government projects, economic development projects, port facilities, toll roads, transit properties, health care institutions, solid waste facilities, and student loan bond issues. 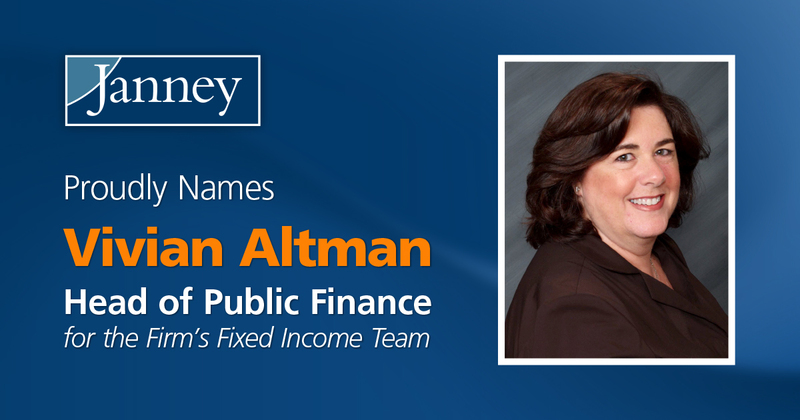 Ms. Altman was named a “Trailblazing Woman in Public Finance” by The Bond Buyer in 2011 and is a founding member and co-president of the Northeast Women in Public Finance. She earned her MA in Economics from the University of Pennsylvania and received her BA in Economics from Barnard College.